Looking for a Yardmaster garage? If you are looking for somewhere to keep your car secure when not in use, don’t spend a fortune building a brick garage when you can have this deluxe Yardmaster 1017 metal garage at a fraction of the price. If you’re looking for a deluxe storage solution for your precious car then this is it. Completely safe, the Yardmaster 1017 Metal Garage is manufactured from hot dipped galvanised steel which keeps it secure plus it has large, hinged double doors enabling you to drive in and out with ease and they are lockable to keep burglars away. Housing your car in this garage will save you on your insurance premium too and the affordable price means that you don’t have to spend a fortune building a garage. 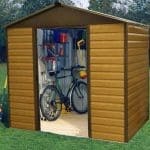 It is an excellent storage building and its handsome looks mean it won’t detract from your house or garden. This is a must for any motorist. Due to the sheer size of this fantastic garage it would also be a great storage solution for all of your outdoor and garden equipment. By adding internal free-standing shelving and the like, you could create the ultimate space for keeping your equipment neat and tidy. 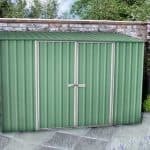 At whatshed.co.uk we understand that a large garage/garden building such as this metal garage will have a large impact on your garden, both space-wise and aesthetically, therefore it is important that you establish whether this is the correct garage for you before purchase. Below, we look at the Yardmaster 1017 metal garage’s many features and how it can fit into your lifestyle and be a solution to your storage needs. Exterior: The metal garage exterior is manufactured from high quality, hot dipped galvanized steel that requires no maintenance whatsoever. With a 10 year rust guarantee you can be assured that your garage will be standing strong and protecting your vehicle in your garden for many years to come. Interior: The spacious 10x17ft interior of the garage will accommodate a single vehicle with ease. With a height of 7ft, taller cars or 4x4s are not a problem. 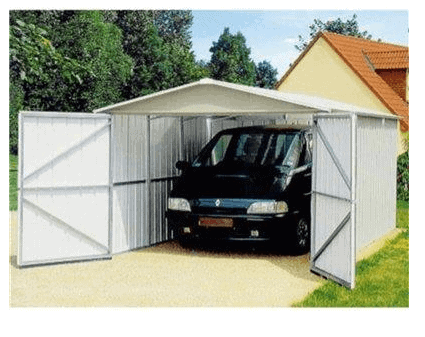 Use a car garage is not this buildings only use – it could also be a fantastic large storage solution for outdoor and garden equipment, particularly useful for those larger items such as trampolines and the like that other garden storage buildings find difficult to accommodate. Windows & Doors: With extra-wide, hinged double doors that cover the full width of the front of the garage make access and parking your vehicle child’s play. Two transparent roof panels enable light to enter the garage interior. 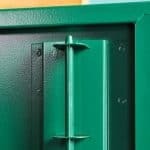 Security: Security is an important factor of a car garage; as such Yardmaster has included a lockable double doors feature which will give you peace of mind as to the security of your vehicle when not in use. The Yardmaster 1017 Metal Garage: How easy to build? The Yardmaster garage is very easy to assemble, even for the complete DIY novice. With such a basic structure and only the main panels/parts to fasten together, you will have your new garage ready to park your car in in no time at all. Full instructions are provided including easy-to-follow diagrams. All parts, fixtures, screws and nails are provided in your package; all that is required for you to provide is a basic tool kit. It is recommended that two people work together to assemble the garage due to the size and height of the parts. The Yardmaster 1017 Metal Garage: What is the overall quality like? 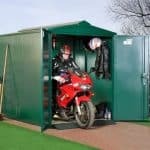 Yardmaster is a company based in the United Kingdom specialising in high quality metal sheds that provide the solution to your outdoor storage problems. 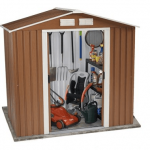 The Yardmaster 1017 metal garage has been designed specifically for use as a car garage but could also be used as a large storage space for your outdoor equipment also. With a hot dipped galvanised steel exterior this garage is maintenance free, providing a versatile an easy solution to your car storage needs. No repainting or finishing will be required and with a 10 year rust guarantee provided by the manufacturers, you can be assured of their confidence that your garage will still be standing strong and looking smart in your garden for many years to come. To clean your garage simply hose down or sponge clean with water or a soapy cleaning solution – easy as that! Great for those with little time on their hands or who simply desire a maintenance free building for their garden. A fantastic 10x17ft space in which to store your car at a fraction of the cost of a brick built garage. Whether used for car storage or storage of garden and outdoor equipment, your items will be protected year round from the elements by a strong galvanised steel exterior. 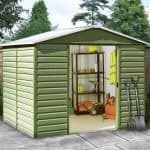 Easy to build and with a 10 year rust guarantee included by the manufacturer, at this price you can’t go wrong with this superb metal garage.